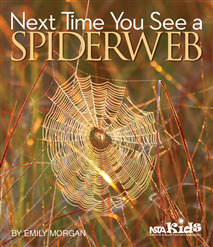 If you know children who say “Ick!” when they spot a spider, this irresistible book will make them say “Ooh!” instead. Next Time You See a Spiderweb describes how these small, skillful creatures weave some of nature’s most clever traps—their webs. Author Emily Morgan shows how spiders snare their prey with tangled webs, funnel webs, and intricate orb webs. The book tells how spiders spin sticky silk without getting stuck themselves. And it reveals the surprising tricks of the jumping spider, fishing spider, and trap-door spider. Next Time You See a Spiderweb is a book that children and adults alike will want to take along on their next nature walk. Awaken a sense of wonder in a child with the Next Time You See series from NSTA Kids. The books will inspire elementary-age children to experience the enchantment of everyday phenomena such as spiderwebs, the Moon, maple seeds, pill bugs, sunsets, seashells, and fireflies. Free supplementary activities are available on the NSTA website. The photographs are stunning and pages at the end include information about the photos, a list of “Activities to Encourage a Sense of Wonder about Spiderwebs,” resources, and websites. ... Next Time You See a Spiderweb should help young people appreciate arachnids and the webs they weave. The introduction states that the books are intended to be read with a child after he/she has had experience of the subjects, which will certainly give rise to further questions and observations by adult and child alike. However, I would argue that if a child picked up this book in the school library, beforehand, the amazing photography would inevitably entice a child to look for spider webs to find out more. Either way, the book definitely succeeds in its aim to inspire a sense of awe and wonder. From the very first page, the author makes excellent use of questions to encourage a child to observe a spider web. ... This book is worth buying for the quality of the sharp close-up photography alone but, coupled with the well-written text, I would highly recommend it to teachers and parents alike. If you know a child who doesn’t like spiders, this book is sure to make them think again – the spider web really is a miracle!